Thousands of pro AV professionals will descend on Las Vegas for the 2019 NAB Show this month. Held April 8-11, the event is billed as the “ultimate event for technology professionals looking for new and innovative ways to create, manage, deliver, and monetize content on any platform,” according to the show’s website. With over 100,000 attendees from 160-plus countries, there is sure to be an excited energy on the show floor. What trends will cause this excitement? NewTek’s Brian Olson, the company’s vice president of product management, agrees on upping the IP ante. “I expect to see more IP connectivity for both audio and video. The wave has already started, and it’s not going to stop,” he said. What are people looking forward to at the 2019 show? Is it the huge number of classes available? New tech introductions? Networking? NewTek’s Olson is interested in changes in cloud technology. “I’m looking forward to seeing what else has moved into the cloud. Many challenges still exist, but the barriers to full, end-to-end IP networked systems are coming down steadily,” he explained. With new technology and new applications—like NAB’s inaugural Esport Experience focused on online gaming trends and content delivery technologies—there is sure to be something for everyone at the 2019 show. 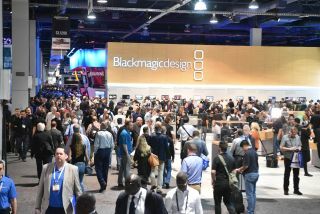 Scroll through the gallery below to see what manufacturers—like Black Box, Clear-Com, Shure, and more—will be showcasing at NAB 2019. The Matrox Monarch LCS multisource streaming and recording appliance makes live webcasting simple by delivering high-quality streams to Facebook Live, YouTube, or a favorite CDN, with multicamera production value, and without operator assistance. Users can simply set the production layout and delivery settings before the event, connect the live sources, and begin the webcast. The Emerald KVM over IP product family provides the flexibility and network security essential to state-of-the-art KVM extension and switching. The Emerald 4K and Emerald SE transmitter-receiver pairs can connect users at their workstations with remote computers and servers across distances up to 10 km over single-mode fiber, or even farther over IP. Emerald delivers value by lowering the total cost of ownership and helping extend the life of existing IT investments. The MV88+ Video Kit is an all-in-one solution for capturing professional-quality recordings on the go. Designed for digital journalists, podcasters, videographers, and mobile content creators, the MV88+ features a digital stereo condenser microphone, Manfrotto PIXI tripod, phone clamp, and mount, as well as iOS and USB-C cables for enhanced compatibility and connectivity. tvONE’s video processing just got more powerful with enhanced CORIOmaster, which features a new secure communication suite with full REST API and multi-user control to protect installations from outside interference, and a new HDMI 4-port output module that upgrades CORIOmaster to up to 56 outputs for massive video walls, projector edge-blends, and LED installations. Finally, it includes new embedded audio support and a dedicated audio module. Neutrik’s new mediaCON products interconnect hard drives, cameras, video monitors, audio interfaces, and computer hardware. They include robust lockable USB Type C cable assemblies and chassis connectors for PCB-mounted USB IF receptacles. Components are designed for data rates up to 10 GB/s (USB 3.1 Gen 2), 100W power, and 10,000 mating cycles. VITEC’s EZ TV IPTV & Digital Signage Solution simplifies the management of live and on-demand IPTV, digital signage, and video wall content from a centralized, user-friendly platform. According to the company, VITEC’s affordable hardware-based endpoints ensure that every stream is reliably disseminated with ultra-low latency and broadcast quality to any screen on the network. Clear-Com’s new V-Series Iris Panel provides users with low-latency audio-over-IP connectivity using AES67. Full-color, configurable OLED displays show color-coded grouping. The new E-IPA IP card can deploy up to 64 Iris panels per card. Iris panels are backward-compatible with the MVX-A16 and IVC-32 cards. VidOvation’s AVIWEST HE4000 4K Ultra HD HEVC live encoder uses the public internet for video contribution and distribution, helping users avoid the high costs of satellite transmission. The HE4000 is designed for real-time delivery of live UHD or HD content over unmanaged IP networks. The compact, half-RU encoder combines 10-bit and 4:2:2 HEVC encoding with the latest generation of AVIWEST SafeStreams technology to deliver live video content over IP at low latencies and bit rates. The Leyard TVF Series is a family of fine pitch LED video wall displays available in 1.5-, 1.8-, and 2.5 mm pixel pitches. With a 27-inch, slim-profile display cabinet, the Leyard TVF Series features front serviceability and a creative, stackable design that eliminates cabinet-to-cabinet cabling and reduces the complexity of installation and vertical alignment. DPA’s d:screet CORE 6066 Subminiature Headset Microphone is 3 mm in diameter. It is a completely redesigned one-size-fits-all headset that attaches comfortably over the ears, with a spring mechanism that securely grips the ears and head.